CNN--Moscow is supposed to be the most expensive city in the world to live in, and is 34.4% more expensive than New York City. But I don't think that translates to Moscow being the most expensive city for a tourist to travel to. In fact, our group has found Moscow to be relatively inexpensive, probably much cheaper than NYC for most items. For example, the Moscow Metro subway system has to be the best value, and maybe the most efficient system in the world. A 10-fare pass costs 165 rubles, which is about 70 cents per trip (including as many transfers as you need), and the trains come literaly every couple minutes, so you never have to wait more than a minute or so for the next train. There are 12 different lines connecting all parts of the city, 176 stations, and more than 7 million passengers on an average weekday! The stations have to be the most ornate in the world, with marble floors and walls, stained glass, chandaliers, etc., it's more like being in a church or museum or bank lobby than a subway station (see photo above). Dinner tonight at an excellent restaurant on the famous Arbat Street for two cost only about $40 with 2 drinks each, and we bought beer last night for $2 at a food court in an upscale mall next to Red Square. nice report. makes me want to visit. and $2 beer! 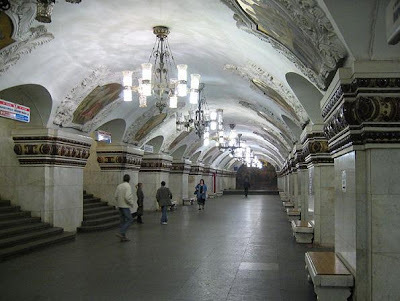 Is the picture Moscow's subway station? It is so classic. Moscow's subways are all that way, and it is only expensive city becasue of the RENT. It is the housing and electronics that costs the most. I lived in New York and am living in Moscow now. Moscow is about 1/3 the price w/ regard to real estate. Also, food is fairly cheap as long as you're not in the center. Overall, Moscow is about 1/3 the cost of NYC, but the average salaries are 1/4 to 1/5th. Moscow the most expensive city. Whatever.